Two Thursdays ago, I was roasting coffee in the backyard. My coffee roasting routine consists of putting the beans onto the rotisserie, and then tidying up all the chaos in the backyard until the beans are done. Experience has taught me that if I return inside the house while the beans are roasting, something will go wrong like the rotisserie will stall leaving me with burned beans on the bottom and green beans on the top. While abating the chaos, I angered some yellow jackets who nested near the rock wall. Then, a series of unfortunate events occurred: angry wasps flew into my hair and got stuck on my scalp due to my ponytail; I tried to run from them, but since they were all stuck in my hair this was futile and resulted in riling up the wasps even more; and then I got stung at least twice. I had to channel some inner zen to undo my ponytail to release the wasps and stop the stinging. Yeah, that wasn't my best moment. My poor dogs were in the backyard with me, and all my waving around made them think we were playing a game of chase, so they were running around with me, and unfortunately were also attacked by the ruthless yellow jackets. When I told the boy about my nasty encounter, he was ready to fight. However, he also was determined to do it himself because I made the mistake of telling him that a friend called an exterminator and it costs her around $100 and only took 10 minutes. In my mind, I was thinking, $100, what a bargain! In his mind, he was thinking, $100 for 10 minutes, what a rip-off! Eradicate the Yellow Jackets 1.0 consisted of a trip to the hardware store to acquire the cheapest wasp trap, a $7 fake flower that attaches to the top of a 2-liter soda bottle. The wasps walk in, attracted to the soda, and they never walk out. After setting the trap at dusk, we waited. And waited. And waited. Finally, we went to sleep, thinking that we'd wake up to find half the nest drowned in the Mexican Sangria soda. Apparently, yellow jackets hate sangria soda, although they were definitely interested because they buzzed around the bottle during the day, terrifying our already-stung dogs who refused to go into the backyard to do their business due to the evil wasps. Again, I wanted to call up an exterminator. Again, the boy thought he could fix the problem himself, so Eradicate the Yellow Jackets 2.0 started and he set about making a homemade anti-wasp suit out of a mosquito net, a mechanics jumpsuit, and 2 rubber bands. Although I warned him that I wouldn't let him back into the house if he had a hoard of angry wasps at his back (I had just listened to Sigourney Weaver talking about her character Ellen Ripley), he was still irritated that I left him outside until he was wasp free. Or maybe he was irritated that I took a video of him as he was making an adjustment to the wasp trap? 2 days pass, and still no wasps are in the stupid trap. Not only that, but the amount of wasps going in and out of their nests is increasing. Our whole backyard was abuzz! So, again, I wanted to call an exterminator. Again, the boy thought he could fix the problem himself. You may recall from previous posts that he has been actively brewing beer since January. 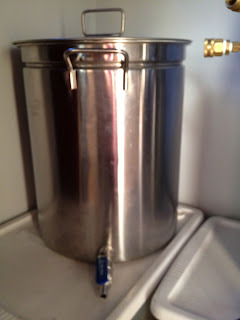 Our living room, in fact, is full of beer brewing equipment like this giant 11-gallon pot with a ball valve at the end. The boy's next idea was to wait until the wasps were sleeping, set this pot full of boiling water onto a step stool, aim the valve at the wasp nest entrance, open the valve, and then run like hell back into the house. So, at midnight on a Saturday, Eradicate the Yellow Jackets 3.0 commenced. I went to bed in protest because I thought it was an elaborate way for the boy to get burned and stung. But you know what? Eradicate the Yellow Jackets 3.0, a.k.a. Yellow Jacket Sting, was a success! Apparently, it took 2 pots of boiling water, a shovel to mix the hot mud into the nest, and a strong stomach to look at the squirming wasp larvae. The dogs can now safely do their business in the backyard in peace. The boy was most proud that this was a chemical free way to take care of the wasps, although I'm not sure I'd recommend this solution to anyone else. The next day, we took a field trip to the Petaluma Seed Bank (purple fava beans and German radishes! ), Hallie's Diner (poached eggs had a hard boiled yolk, but the cornmeal pancakes were the best I've had), and the Lagunitas Brewing Company (meh). We also stopped at a hardware store to look at compost bins, but since they were over $100.... Well, you know where this is going. The compost bin on the left is made from old IKEA patio furniture, and the compost bin on the right is from the boy's stick collection and some wire. We have to add some netting to the twiggy compost bin because the leaves won't stay put. Also, rodents like the kitchen scraps, and the last thing I want to do is have a rodent nest in my compost bin. I already filled the IKEA compost bin with some leaves from our backyard layered with the gross compost soup I had brewing for over a year in a garbage can. We called that can's contents poop soup since I did a poor job managing that bin. Now, however, it just smells like dirt. I'll let it sit for a year to do its thing. Is there a moral to these stories? If there is, it would have to incorporate persistence and, ahem, being cheap. OMG i still say $100 is a steal! at least you didn't have to do any of the work, right?! :) my goodness, he is definitely a persistent one isn't he?! 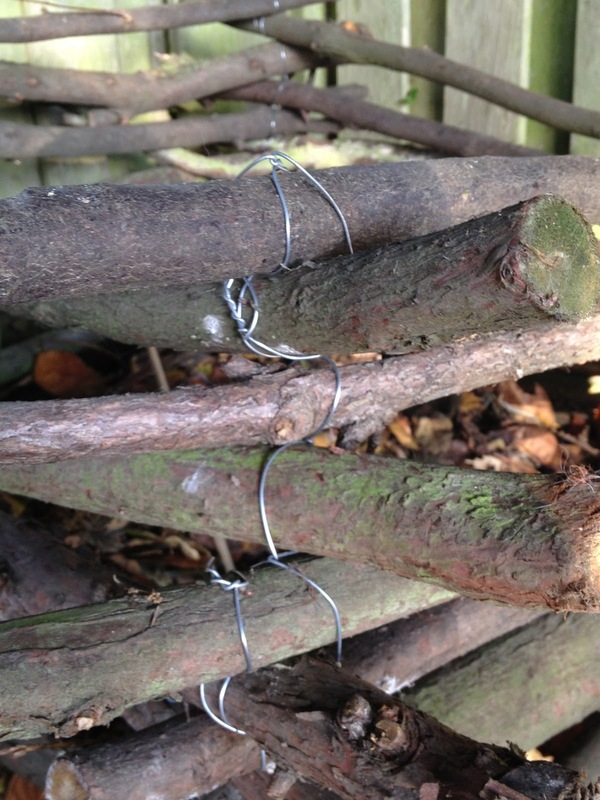 I am also fascinated that the boy had a stick collection! kimchi, no kidding! But, him being an avid DIYer has its upside, like the good beer and never having to call a plumber. It's a double edged sword. Foodycat, it's actually sticks from around our yard, primarily from the coastal redwood tree. He sets the sticks aside for a year or two so it can cure, then he finds something to do with them. Usually, the pile annoys me since our yard is so tiny, but this time, it came in handy!